Set in a futuristic South Africa where everyone has their own personal robot making their life easier, a vengeful godess is slowly preparing the end of humanity as we know itand an AI uprising is upcoming. And all of that because of a new hallucinogenic drug which gives humans superpowers. 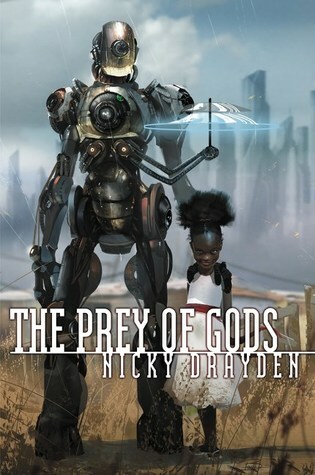 The Prey of Gods follows an old goddess, a young girl that has the power to overpower her, a teenage boy, a pop star and a politician who is Stoker during the day and Felicity Stokes at night and who has a lot of mommy issues. This book is a mess but a very enjoyable one. If you don’t like absurd books, I wouldn’t recommend this one but, I personally really loved it. It was very weird but I was hooked right at the beginning, I could tell I was going to end up liking it a lot after the first chapter. I devoured this book in two sittings and I think it’s a perfect book to read during holidays, it’s fun, fast-paced,hilarious and it really doesn’t take itself too seriously. If you are not sure it’s something for you, download a sample (from Amazon for example) and read the first chapter, if you like the opening, you will probably like the rest! So yeah, I don’t have much to say except that it is really a fantastic debut, it really managed to blend the elements of SF and fantasy very well and that I will definitely read anything else Drayden puts out in the future! I’ve been trying to get to this for months, but your review is a reminder that I need to make time as soon as possible! I love “messy” books if they’re well done, and this sounds like it is. I really hope I get the chance to read this one before the year is out. I’ve heard nothing but good things. Maybe during the winter months, as that’s when I catch up with books I missed!